Current affairs can play a crucial in the selection of an IAS aspirant in the final list of IAS Exam. A steady practice of current affairs is required for IAS Prelims Exam and it will give a way to score better in every stage of IAS Exam. 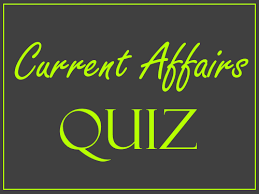 Here, we have provided a current affairs quiz important for IAS preparation. In order to get success in IAS Exam, an IAS aspirant must have better preparation of current affairs. A number of questions can be asked in IAS Prelims Exam based on the recent events of national and international importance. Here, we have provided current affairs quizzes which are based on the events happened in the month of May 2017. The given current affairs quizzes are very important for the upcoming IAS Prelims Exam 2017. 2. Recently the Union Cabinet has given its ex-post facto approval for the signing the Memorandum of Cooperation (MoC) on Railway Safety with which of the following countries? DMI&SP policy provides a minimum value addition of 15% in notified steel products which are covered under preferential procurement. In order to provide flexibility, Ministry of Steel may review specified steel products and the minimum value addition criterion. 5. South Western Command’s Corps ‘Strike One’ successfully carried out the firing of the advanced BRAHMOS Block III land attack cruise missile system on 3rd May in which of the following Islands of India?